BATAVIA, Ohio (Jan. 24, 2018) – The Clermont County Transportation Improvement District (CCTID) today announced that the Ohio Department of Transportation (ODOT) will invest an additional $5 million in Clermont County to support ongoing infrastructure improvements along the State Route (SR) 32 corridor. The award is part of the highly competitive Transportation Review Advisory Committee process, which will allocate $55 million for statewide infrastructure improvements during this funding cycle. Manger said the $5 million award would be used to fund property acquisition costs related to the construction of an interchange to replace the intersection of SR 32 with Bach-Buxton Road and Elick Lane, which is part of the Eastern Corridor Program of projects. These improvements, which include an additional travel lane on SR 32 in each direction, will allow traffic to move from I-275 to Batavia on SR 32 without a traffic signal. The funding will also help open up economic development opportunities in Clermont County and east along the SR 32 corridor. “We believe ODOT recognized the importance of funding this project work because of the strong connection SR 32 has to supporting increased investment throughout the entire southern region of the state,” said Clermont County Commissioner and Board President Ed Humphrey. SR 32 is one of the highest-volume local routes in Ohio and is a critical east-west connection for the movement of people, goods and services throughout the state. Current projections show that traffic volumes on SR 32 are approaching interstate levels and that by the year 2030, SR 32 is expected to carry 79,000 vehicles per day, not much less than I-275’s estimated 84,000 vehicles a day. Investments along the corridor have already resulted in tangible development opportunities with the completion of access improvements to the South Afton Commerce Park in 2017. South Afton Commerce Park is a business-ready site for manufacturers. “Business-ready sites are considered highly attractive to potential companies because they reduce the time it takes for companies to locate and start operations in a given location,” said Humphrey. “More than 1,850 jobs are expected to be created directly at the South Afton site, with an additional 1,675 new jobs with suppliers and other supporting services. The development is expected to lead to $1.5 billion in local economic activity per year once completed,” he added. Later this year, the Transportation Improvement District will begin making improvements on SR 32 at Bells Lane; and ODOT will complete work to add a second lane from the southbound I-275 exit to SR 32 and construct an additional travel lane on eastbound SR 32 from GlenEste-Withamsville Road to Olive Branch-Stonelick Road. In 2019, the Clepper Lane Extension will be built, Old SR 74 will be widened from Schoolhouse Road to GlenEste-Withamsville Road, and access improvements at Old SR 74, Tealtown Road and Paul Drive will be made. The Clermont County Transportation Improvement District (CCTID) works across geographic and political lines to improve the quality of life for Clermont County residents by stimulating economic development through regional transportation improvements. The five-member board is made up of representatives from the Clermont County Engineer’s Office, Clermont County, Miami and Union Townships, and the private sector. The CCTID is currently working on nearly two dozen roadway improvements that will increase safety, support better traffic flow through the area, and provide the infrastructure for continued economic development throughout the county. More information about the CCTID and their project work can be found on-line at GoClermont.org. 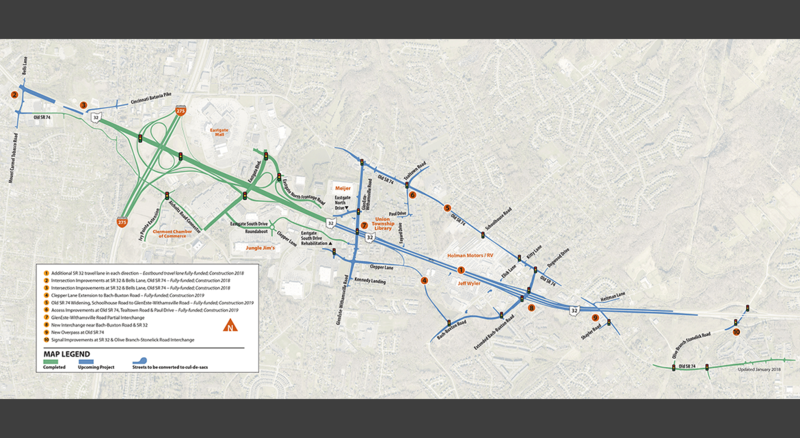 The Eastern Corridor is a program of integrated, multi-modal transportation investments. The Program will enhance our regional transportation network by improving travel and connections between central Cincinnati and the communities extending east through Hamilton County into western Clermont County. Program elements include improvements to existing road networks, new and expanded roadways, rail transit, expanded bus routes and improvements for pedestrians and bicyclists. The Eastern Corridor Program is administered by the Ohio Department of Transportation (ODOT) in cooperation with the Federal Highway Administration (FHWA) and the Eastern Corridor Implementation Partners. The Eastern Corridor Implementation Partners include the Hamilton County Transportation Improvement District, the Clermont County Transportation Improvement District, the City of Cincinnati, the Ohio-Kentucky-Indiana Regional Council of Governments, the Southwest Ohio Regional Transit Authority and the Ohio Department of Transportation. To learn more, go to: EasternCorridor.org.